Once, there were about a million Attwater’s Prairie Chickens to be found on six million acres of coastal prairie. Their range is known to be from the Nueces River near Corpus Christi in the coastal bend area of Texas to Bayou Teche in Louisiana and inland about 75 miles. Between urbanization and fire suppression which allows woody species to take hold, much of that prairie, some estimates as high as 98% of it, has disappeared. The prairie chickens had no where to go! 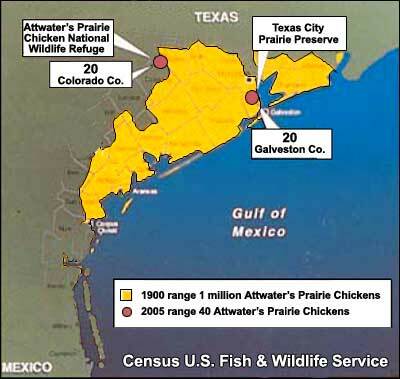 Attwater's Prairie Chicken: 1 million along Texas coast in 1900; 68 in 1995 – 2 in Austin Co.; 10 in Colorado Co.; 16 in Galveston Co.; and 40 in Refugio Co.
By 1919, the Attwater’s Prairie Chicken was extripated from Louisiana. Estimates in 1937 showed only about 8700 individuals left in Texas – less than 1% of the population. This signaled the end of hunting for this once popular and common game bird. The bird was listed as endangered in 1967 with an estimated population of 1070 birds – 0.1% of the historic population. In 1973 the Endangered Species Act provided immediate protection for the seriously declining bird. A devastating series of droughts and floods between 1980 and 1994 seriously impacted the birds such that by 1994 less than 160 individuals could be found in the wild. While 1 – 2% of the original prairie may still exist, much of that prairie is fragmented as small pockets that are useless for this bird. This isolation onto ever smaller pockets of land, creates a situation where predators of the prairie chickens thrive as the useable habitat decreases.